Hollywood’s studios are all benefitting from China’s box office boom, but they’re not benefitting equally. Some have been much more effective than others at getting their films into Chinese movie theaters, and their financial results from China distribution have varied widely. The top grossing major studio, Paramount, has over the past couple of years earned more than four times as much from its China releases as the sixth place studio, Universal. Hollywood needs to pay close attention to how it’s doing in China, and to invest time and energy to figure out how it can do better there. While there are certainly other important territories, none comes close to matching China’s torrid growth and rapidly swelling global importance. The analysis presented below provides what I hope is a valuable snapshot, and a few useful insights, about where American distributors stand in China today. 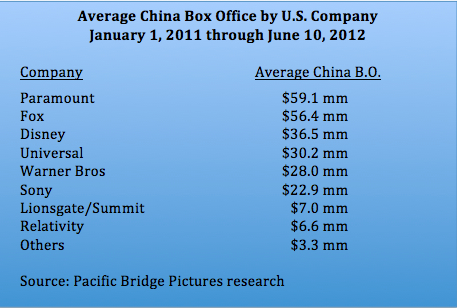 To conduct this analysis I reviewed the box office results of the more than 60 American films that were released in China during the nearly 18 month period from January 1st, 2011 through June 10th, 2012. These included both revenue-sharing ‘quota’ films and ‘flat fee’ imports. I classified each film as belonging to a single U.S. distributor—a task that was not as easy as it sounds, because quite a few films are released by one company in the U.S. and by an entirely different company in China. My test was to assess, as best as I could, which company was receiving the distribution receipts from China, and to assign that company as the American distributor of record for the purposes of this study. During the 18-month study period, Sony, Paramount, Warner Bros and Disney each exported 7 or more films to China, while Fox placed just 4 films there and Universal only 3. The ability to obtain quota slots has been a key factor separating the most financially successful studios in China from the least successful ones. 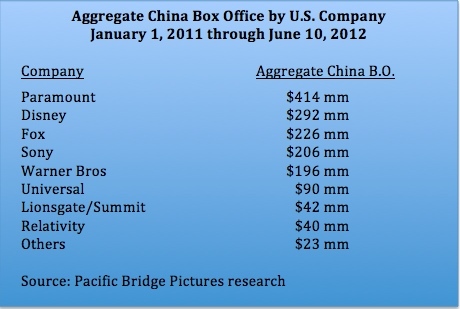 Also important, of course, is the relative box office drawing power of each American studio’s films with Chinese audiences. On that score Paramount was also the leader with an average of $59 million per release, while Sony brought up the rear among major studios with barely a third of that figure, at $23 million per release. 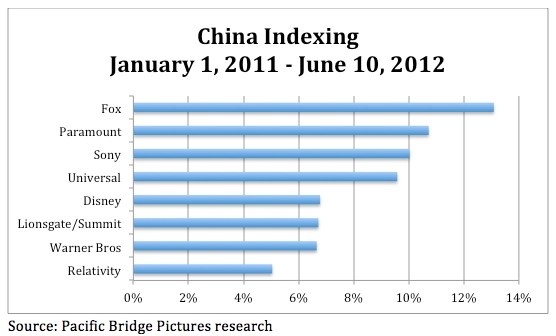 Another useful measure to examine is China indexing, that is, the share of total worldwide box office earned by each company’s films in China. This figure tells us how ‘China friendly’ each company’s slate has been; the higher the number, the greater the China appeal. By this measure Twentieth Century Fox, with its out-sized China release of Titanic, led the way. Had it not been for Titanic, Paramount would have led on this score too. When the studios started making the films that are the subject of this study, it’s unlikely that any of them were thinking much about China. But the world has changed in the past two years. Given China’s rapid emergence, all of the studios will need to fully incorporate China into their strategies for developing, producing and distributing their global films. While the film genres, their stories, and their overall suitability for China are all important, of equal or even greater importance are the studios’ continued access to distribution, and the effectiveness of the marketing and releasing of their films. Toward this end, co-producing movies with Chinese partners will become an increasingly important tactic for American companies to enhance their standing and to exercise greater control over their results in the PRC. This entry was posted in Uncategorized and tagged China box office, Disney, Disney Fox Lionsgate/Summit Paramount Relativity Sony Universal Warner Bros Summit, Fox, Lionsgate/Summit, Paramount, Relativity, Sony Pictures, studio box office in China, Universal, Warner Bros by chinafilmbiz. Bookmark the permalink. This is a great report. Yet, I do not understand why you keep promoting co-production as the solution. First, Hollywood does not have a co-production culture: this new trend is only an opportunistic approach to do whatever it takes to go around the Chinese quotas. And I remind you that the quotas have been recently raised and seriously threaten (between other things) the future of Chinese cinema since they do not come with any specific mechanism to protect national productions. Second, these so-called “co-productions” are “co-financing” deals: they are not made within the frame of any treaty, they do not imply any creative cooperation, they do not orchestrate any exchange of know-how. These “co-financing” deals serve only the appetite for money of unscrupulous Chinese producers who have no true concern for the development of their film industry in the long term. What they say does not match what they do, and the Studios are currently quite successful buying their way in the Chinese market; although this remains a challenge in many ways, they definitely got the attention and the support of the big Chinese players whose new motto is “Competition is good for Chinese movies”. Ah Ah Ah. Many Chinese CEOs sometimes say and obviously think: “take the money now”, and this is something the US players understand so well. Finally, the “co-financing” deals do not serve any long-term strategy for the construction of the Chinese film industry. There is too much money involved on the US side (which focuses first on the US market) that there is no intention to give away any form of creative control, nor to replace some established US heads of department by any Chinese counterparts, nor to hire Chinese interns and serve the training of aspiring Chinese directors and writers. In any creative process, you do not learn just watching others do things for you. The film industry is an industry whose know-how is transferred from “master to apprentice”. I do not see anywhere that “co-financing” deals evoke or address such issues. The current situation is extraordinary as all players seem to be frustrated whereas the game is been played in the background, and the US are winning big. From a cultural standpoint, the US cultural leadership is definitely making big steps in China.